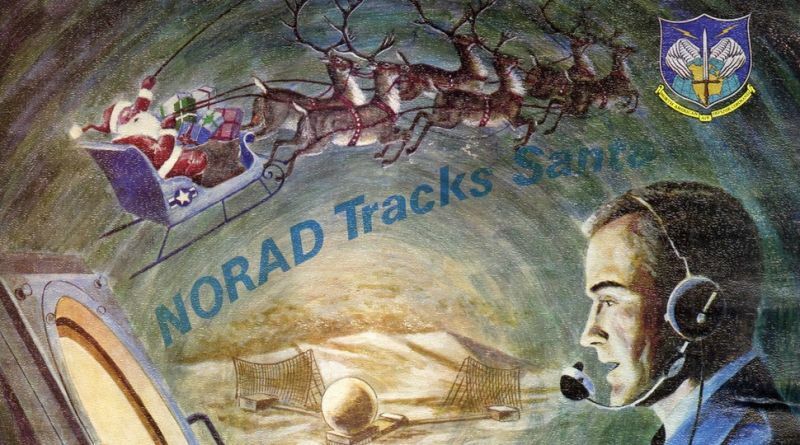 You’ve probably read the tinsel-and-glitter story about NORAD tracking Santa Claus on Christmas Eve – like Santa’s sleigh, it goes the rounds every year – but Matt Novak provides an appropriately explosive rendition of it here. Among other plums in the pudding, Matt pulls out a syndicated story from AP in December 1955, in which the military promised that it would ‘continue to track and guard Santa and his sleigh on his trip to and from the U.S. against possible attack from those who do not believe in Christmas‘ (emphasis added). the “systematic destruction” of Soviet bloc urban-industrial targets that specifically and explicitly targeted “population” in all cities, including Beijing, Moscow, Leningrad, East Berlin, and Warsaw. Purposefully targeting civilian populations as such directly conflicted with the international norms of the day, which prohibited attacks on people per se (as opposed to military installations with civilians nearby). The study ‘listed over 1200 cities in the Soviet bloc, from East Germany to China, also with priorities established. Moscow and Leningrad were priority one and two respectively. 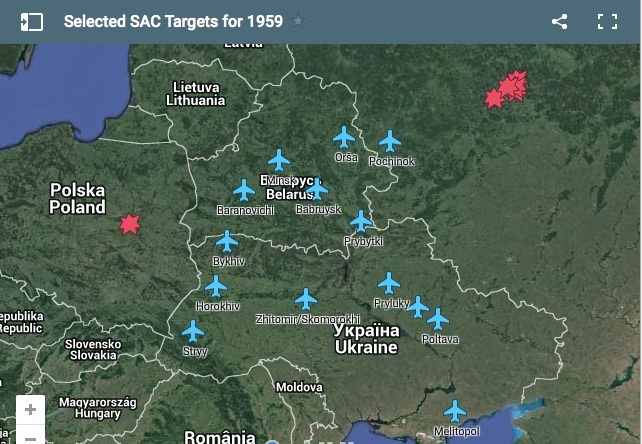 Moscow included 179 Designated Ground Zeros (DGZs) while Leningrad had 145, including “population” targets.’ Every target was preceded by an eight-digit code from the Bombing Encyclopedia. 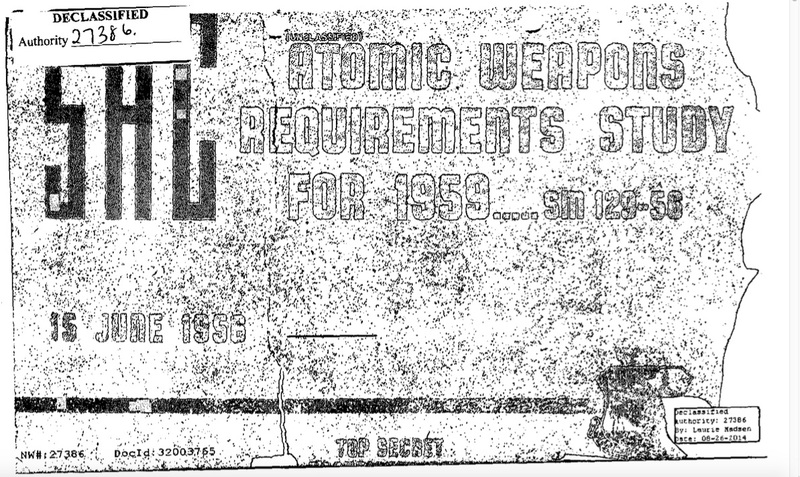 William Burr provides an excellent, detailed commentary to accompany the Study here; you can also find more from Joseph Trevithick on this ‘catalog of nuclear death over at War is Boring here. But all of this is prelude to the real plum in my Christmas pudding, the best paper I’ve read all year: Joseph Masco‘s ‘The Age of Fallout’ in the latest issue of History of the Present [5 (2) (2015) 137-168]. Being able to assume a planetary, as opposed to a global, imaginary is a surprisingly recent phenomenon. Although depictions of an earthly sphere are longstanding and multiple, I would argue that the specific attributes of being able to see the entire planet as a single unit or system is a Cold War creation. This mode of thinking is therefore deeply imbricated not only in nuclear age militarism, but also in specific forms of twentieth-century knowledge production and a related proliferation of visualization technologies. A planetary imaginary includes globalities of every kind (finance, technology, international relations) – along with geology, atmosphere, glaciers, oceans, and the biosphere – as one totality. What is increasingly powerful about this point of view is that it both relies on the national security state for the technologies, finances, and interests that create the possibility of seeing in this fashion, but also, in a single gesture, exceeds the nation-state as the political form that matters. A planetary optic is thus a national security creation (in its scientific infrastructures, visualization technologies, and governing ambitions) that transcends these structures to offer an alternative ground for politics and future making. Proliferating forms of globality – including the specific visualizations of science, finance, politics, and environment – each achieve ultimate scale and are unified at the level of the planetary. This achievement ultimately raises an important set of questions about how collective security problems can, and should, be imagined. Its horizons are as much spatial as they are temporal – though Joe makes the sharp point that radioactive fallout was initially conceived as ‘the bomb’s lesser form’ and that it was the ‘explosive power of the bomb that was fetishized by the US military’ – and that fallout involves ‘individual actions and lived consequences, a post-sociality lived in isolation from the collective action of society or the war machine’ that mutates into what he sees as ‘an increasingly post-Foucaudian kind of governmentality’. When he elaborates the multiple registers in which radioactive fallout appears as an atmospheric toxicity Joe moves far beyond the nostrums of Peter Sloterdijk and others – which, to me anyway, seem to be based on almost wilfully superficial research – and connects it, both substantively and imaginatively, to contemporary critical discussions around global climate change and the Anthropocene. Space and time are radically reconfigured in these fallout studies, constituting a vision of a collective future that is incrementally changing in unknown ways through cumulative industrial effects. The logics of a national security state (with its linkage of a discrete territory to a specific population) becomes paradoxical in the face of mounting evidence of ecological damage on a collective scale, not from nuclear war itself but rather from nuclear research and development programs. 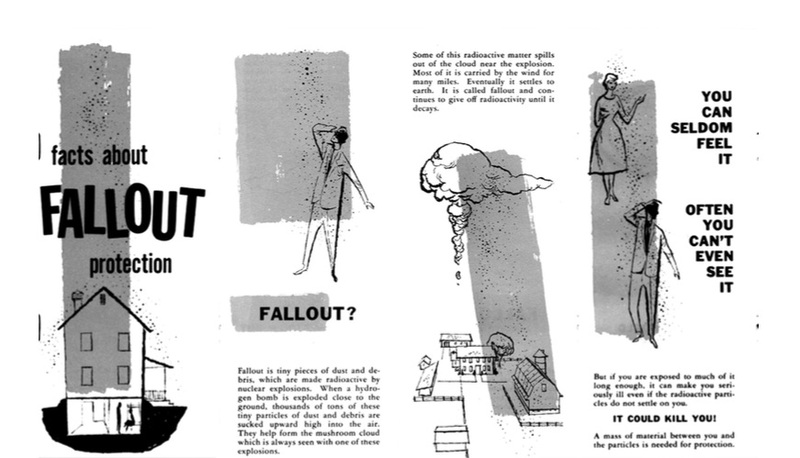 It is important to recognize that while cast as “experiments,” U.S. atmospheric nuclear tests were in reality planetary-scale environmental events. In applying the lessons of the twentieth-century nuclear complex to contemporary geoengineering schemes to manage climate change, we might question 1) the claim to both newness and absolute crisis that installs a state of emergency and suspends normal forms of law and regulation; 2) a process that rhetorically reproduces the split between the event and its fallout so completely; and 3) the suggestion that geoengineering is a novel activity, that it is not an ancient practice with many antecedent examples to think with in assessing our current moment. We might also interrogate how the past fifty years of multidisciplinary work to create detailed visualizations of the planet has installed a dangerous confidence in globality itself, as increasingly high resolution visualizations come to stand in for both objectivity and sovereignty, and thus enable psychosocial feelings of control over vastly complex earth systems that remain, at best, only partially understood. It’s an immensely provocative, perceptive paragraph; it not only makes me retrace my own wanderings through the nuclear wastelands (see here, here and here) but it also obliges me to rethink what I once called ‘the everywhere war’, to map its contours much more carefully (the original impulse was simply to provide a counterpoint to those commentators who emphasised war time – ‘the forever war’, ‘permanent war’, ‘never-ending war’ – and who never noticed its spaces), and – particularly with that remark about ‘high resolution visualizations com[ing] to stand in for both objectivity and sovereignty’ in mind – perhaps even to see it as another dimension of Joe’s ‘Age of Fallout’. This entry was posted in air wars, arms and weapons, bombing, Cold War, Europe, technology, USA and tagged Anthropocene, Bombing Encyclopedia, everywhere war, fallout, Joseph Masco, Matt Novak, NORAD, nuclear tests, nuclear war, Peter Sloterdijk, William Burr by Derek Gregory. Bookmark the permalink.